Published: July 13, 2018 at 11:29 a.m. Updated: July 13, 2018 at 12:26 p.m.
NFL.com analyst Lance Zierlein will reveal the top CFB players to watch in 2018 at six different positions with an eye toward their NFL potential, continuing today with d-linemen. While we won't speculate about where these potential future NFL stars will go in the draft one day, it's not too soon to take a peek at their game tape and start to stack them as players to watch. Houston's Ed Oliver is one of CFB's most exciting players and might be the most athletic DT you've ever seen. Denver Broncos 2018 first-round pick Bradley Chubb decided against turning pro after his junior season with N.C. State and ended up bolstering his draft stock with a tremendous effort in 2017. Could Clemson's Christian Wilkins see the same sort of jump? When we combine the up-and-coming talent at the position with the established players who opted to go back to school for another season, you can see why people are calling this "the year of the defensive lineman." Lawrence was slowed by a foot injury for much of last season, which might explain his disappointing drop in production. The massive defensive tackle is expected to return healthy this season to impose his will on guards and centers across from him. Despite his 6.5 sacks as a freshman, I see Lawrence as an early down run-stuffer who will come off the field on passing downs once he makes it to the league. Therefore, his draft value will be directly tied to how productive (and frankly, dominant) he can become against the run. He has the size, strength and length to take over games, but we need to see more of it in 2018. After beginning his college career at Michigan State and then spending a year at Copiah-Lincoln Community College (in Wesson, Mississippi), Sweat transferred to Mississippi State where he excelled in the SEC as a first-time starter. Sweat is a lanky defensive end with long arms and a thin lower body. Despite lacking desired play strength, Sweat recorded 15.5 tackles for loss last season, including 10.5 sacks in the final nine games. He can rush with extremely long strides that allow him to close out quarterbacks much more quickly than expected. He also uses those strides and arm length to ensnare ball carriers way out on the perimeter. Sweat can be locked up by power, so it will be important for him to improve his upper- and lower-body strength to counter the power he'll face at the next level. This year Miami had three defensive linemen drafted from last season's team, but Jackson led that D-line in tackles (59) and recorded 6.5 sacks (second-most on the team) as a sophomore. Jackson has great size. He's able to generate outstanding speed and converts it to power in collapsing the pocket from the edge. Jackson has the ability to make relatively sudden lateral movement that helps him finish tackles at difficult angles. From a production standpoint, Jackson's tackles for loss and sack numbers were close to identical from his freshman to sophomore seasons. A noticeable jump in production is often the norm for a defensive lineman in his third year of play -- he could be in for a strong season. Watching Jelks' 2017 tape can be frustrating because of how often the Ducks play him along the interior of their defense. While he has similar height and arm length to former Oregon first-round defensive linemen Arik Armstead and DeForest Buckner, Jelks is substantially lighter than both. He's clearly a better fit on the edge. Jelks is extremely active and surprisingly physical at the point of attack, even though he's giving up a lot of size to the offensive linemen across from him. Jelks managed seven sacks last season despite splitting snaps between defensive tackle and defensive end. At the next level, Jelks will be a 4-3 end with the toughness and rush talent to play on the strong or weak side. Ferguson is a heat-seeking missile once he gets into the backfield. He's a find ball, attack ball run defender with a tremendous closing burst and 41.5 career tackles for loss to prove it. At 6-foot-5 and 259 pounds, he has plus length that he combines with bouncy feet to beat offensive tackles on either their outside or inside shoulders as a pass rusher. Ferguson has experience as a stand-up rusher, as well, and appears to have the athletic ability to play in a 4-3 or 3-4 scheme at the next level. While the level of competition across from him hasn't always been challenging, his physical traits and athletic talent are translatable to the NFL. Wilkins has been deployed at defensive end and defensive tackle, similar to how Alabama used Jonathan Allen before he moved on to the NFL, but Wilkins lacks Allen's high-end pass-rush production. However, Wilkins does have fast hands and quick feet. He uses his lateral quickness to attack gaps and create the type of disruption that can throw blocking schemes off track. Wilkins wins with his athletic ability, football IQ, and motor, but his lack of mass and arm length is something that he will have to learn to work around at the next level. Big and strong. Those two words best describe the Michigan junior defensive end who was able to parlay those traits into a leap forward in his sophomore season. Gary lines up and fires out of a track stance, but he's more of a physical presence as a pass rusher, rather than a player who tries to out-race tackles to the edge. He does a good job of utilizing his arm length to attack tackles when playing the run and his lateral quickness gives him the upper hand when chasing running backs to the sideline or operating in Michigan's twists. I would like to see greater development with his pass-rush plan this season. After watching tape of Ferrell last summer, I didn't find myself getting overly excited about his individual play-making ability, but there is no doubt that I saw that ability on tape when I watched his 2017 film this summer. 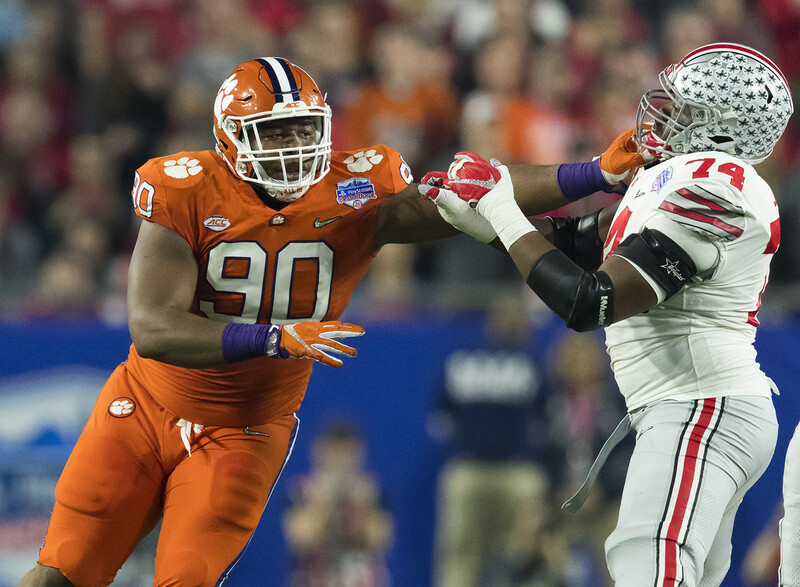 Ferrell's size and play hearkens back to Kevin Dodd and Shaq Lawson from the 2015 Clemson squad. Ferrell offers prototypical size and length as a 4-3 defensive end with a quick get-off and improving hand work as a pass rusher. Ferrell might benefit from playing on a stacked defensive line at Clemson, but many of his 18 tackles for loss and 9.5 sacks were self-made. Clemson has four defensive linemen who should be drafted and Ferrell might have the best upside of them all. Alabama has been cranking out top talents along the defensive line hand over fist and Davis is the next one up. At 6-7 and 306 pounds (school measurements), Davis is among the new breed of defenders who fit cleanly in both 4-3 and 3-4 fronts. His frame is chiseled with outstanding lean muscle mass, long arms and a solid anchor at the point of attack. Davis is well-schooled at striking first, getting arm extension and shedding blockers to attack ball carriers. Davis has plus potential as a pass rusher, but still needs development in that area. While Houston's Ed Oliver is the better player right now, Davis has the elite physical traits teams covet. The compact, powerfully built Bosa has been consistently productive from the moment he put on the Ohio State uniform. Bosa has quality tape as a 4-3 defensive end and as an interior rusher in sub packages. He's extremely challenging to block thanks to his initial quickness, pad level, and formidable upper-body strength that allows him to disengage quickly as he slithers past blockers. He's not as smooth in his pass-rush approach as his older brother Joey Bosa, but he flashes similar potential to impact the run at the point of attack. The word that best describes Ed Oliver is "troublemaker" because once the football is snapped, he is nothing but trouble for interior linemen. Oliver has rare athletic ability and some of the quickest feet that you will see for a defensive lineman. While his 38.5 tackles for loss, including 10.5 sacks, are indicative of the type of disruption he's capable of, we could see even greater sack production if Houston moves him out wider from time to time. Some scouts believe Oliver weighs quite a bit less than his listed weight of 290, so that will be something to keep an eye on come draft season. Oliver has already stated his intention to enter the 2019 draft as an underclassman.